I am a new patient at Gold Coast Smiles. What can I expect at the first visit? Thank you for choosing us for your dental and oral health care needs! Count on us to provide you with excellent, comprehensive care. With all patients our primary goal is to provide outstanding care in all phases of their treatment. 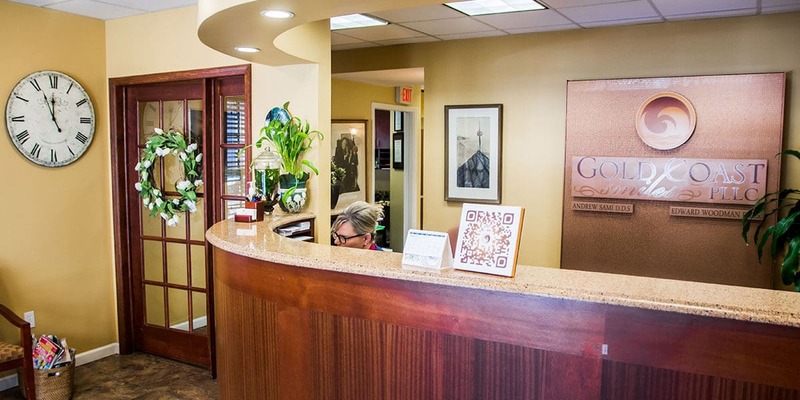 Our relationship begins with a conversation with Dr. Sami in the private consultation room to discuss your present health, along with your goals, your wants and your wishes for your dental healthcare. Next you will be escorted to a treatment room for a Comprehensive Oral Evaluation. After appropriate digital radiographs, (x-rays) are taken, Dr. Sami will examine your teeth, looking for areas of concern such as decay. In addition, he will evaluate the restorations presently in your mouth to make sure they are still working well for you. He will check your gums and the bone supporting your teeth, (your periodontal health), along with checking your bite, (occlusion), and your jaw joints. He will also conduct a Comprehensive Soft Tissue Evaluation along with an oral cancer screening. Upon completion of the evaluation process, Dr. Sami will develop a treatment plan designed specifically for your needs. You will be presented with options for treatment as well as the investment to help you make the decision on how you would like to proceed with your care. Our financial coordinator will meet with you to discuss the costs and options to pay for the dentistry you desire that best fits your lifestyle. No treatment will commence until you have a thorough and comfortable understanding of what to expect.